When it comes to sandwiches, French Dip's are one of my favorites. I've made several versions at home, and this one might be my favorite. These sandwiches only took minutes to prepare, and they tasted fantastic! I made some Au Jus, for dipping, while the crescents were cooking. I just used a packet of McCormick's Au Jus Gravy mix, and it tasted great. 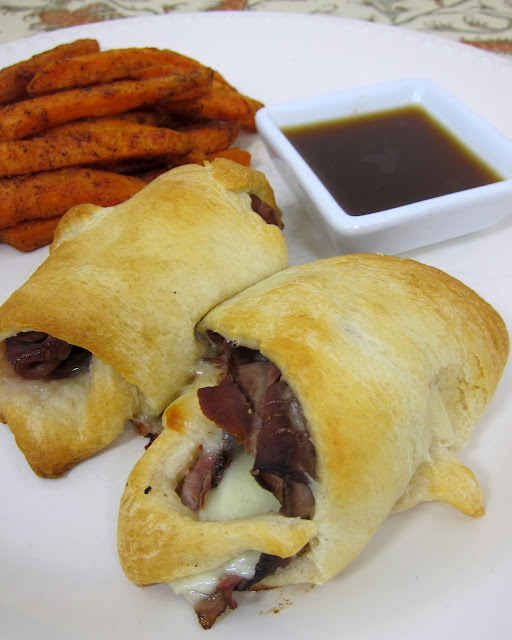 Give these French Dip Crescents a try for lunch or a quick weeknight dinner. They would even be great for tailgating this Fall. Separate crescent rolls into 8 triangles. Spread 1/2 teaspoon horseradish sauce or Ranch dressing on each crescent. Top each crescent with 1/2 slice provolone cheese and roast beef. Roll up crescents and place on baking sheet. Bake for approximately 15 minutes or until golden brown. While crescents are baking, make Au Jus according to directions on packet. Serve with warm crescents. *I used McCormick Au Jus Gravy mix and Boar's Head roast beef. These look like just the ticket for us while watching the Daytona 500 this weekend! Have I told you that you are my Number 1 GO TO when I am needing something AWESOME? Gah! I almost bought roast beef today, but went with ham instead. Oh well, I guess i will just have to use ham, honey mustard and swiss for some rolls! Ive had these on my 'to make soon' list since seeing them on Pinterest but just keep forgetting about them. I'm so glad you posted them. Definitely will make them asap! Oooh I love the look of these! They are delicious! But do yours get soggy from the cheese? Mine did. They were fine when I took them out but they were soggy by the time I got them to the table. STILL DELICIOUS! Amy - mine didn't get soggy. I baked them on one of my stoneware pans - maybe that made a difference. I will try that-- Thank you! I'm going to try these, but substitute Horseradish Cheddar for the provolone and probably pass on the horseradish sauce. Can't wait to try them! These are some tasty looking roll ups, Steph! French dip is one of our faves too. I tried this recipe today and it was delicious! I cut back on the roast beef a bit and used low fat crescents to lighten it up. I mixed horseradish and mayo to put on it and served sliced onion on the side. I LOVED this so much! my two guys were all ugh sandwiches? but when they tasted it....minds were changed! These look so good. I know what I am cooking for dinner next time we have french dips. Do you take your own photographs? The food looks so good!! ACK! My picky husband loved these, you are a genius! I just made these! My 6 year old daughter just ate 4 of the 8. Thank God I had enough for two batches. LOL Thanks for the recipe. Has anyone tried baking then freezing them & reheating? Am looking for some freeze & heat lunch ideas for the dh. Im gonna make these tonight for dinner. I couldn't find the gravy mix so i got the heinz brand that comes in a jar. I hope it tastes good like that. I'm making these for dinner tonight. I couldn't find the gravy mix so I bought the Heinz brand. I hope it taste good like that. Delicious! I added green peppers. YUM! Worked out great - used thinly sliced beef and sauteed that with some garlic. In another pan sauteed onions and peppers. Put meat on the crescents, then onions/peppers and topped with half a slice of provolone cheese. Delicious - a mini philly cheese steak! These were easy and super tasty! Great weeknight dinner.